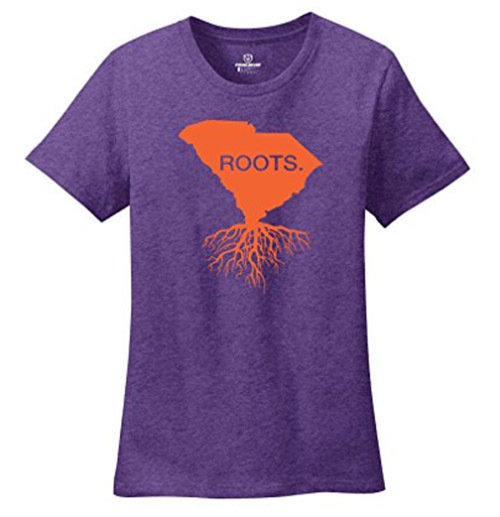 Clemson Girl: Win a comfy and cool Clemson 'roots' tshirt! Win a comfy and cool Clemson 'roots' tshirt! We love, love, love anything Clemson - and we love, love, love comfy and cute t-shirts. So of course, we love, love, love this cute Clemson orange and purple South Carolina Roots t-shirt from ProSleeves that they are selling on Amazon. This shirt would be great for gameday (or any day) paired with jeans. Show your South Carolina state and Clemson pride and where your roots lie with this shirt. And guess what? ProSleeves is generously offering to giveaway one of these shirts to a very lucky Clemson Girl in a size of the winner's choice! But you don't have to wait to see if you win if you want one of these shirts now. ProSleeves has created a special coupon code for us that will get you 40% off your purchase! Just enter TIGERTEE for the coupon code at checkout. The giveaway ends at Midnight EST on Sunday, November 5. We will randomly draw a winner and contact the winner by email. The winner has 72 hours to respond to our email or we will draw a new winner. Special thanks to ProSleeves for sponsoring this Clemson South Carolina Roots t-shirt giveaway. Good luck Clemson Girls and GO TIGERS!